The Mrs. Piggle-Wiggle books by Betty MacDonald were released in the 1950’s. Now more than 50 years later, Ann M. Martin has taken over the writing of a sequel to the charming series. 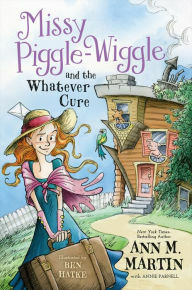 “Missy Piggle-Wiggle” the sequel was released this week and begins with Mrs. Piggle-Wiggle’s grandniece assuming the role of fixer-of-all-children in the upside-down house. Updated from the original stories, the new title features modern props absent in the old-fashioned originals. However, Ann M. Martin (author of “Babysitter’s Club,” “Rain, Reign,” “The Doll People,” and “Corner of the Universe,”) has remained true to the spirit of the MacDonald tales. This week’s New York Magazine (September 5th issue) and Vulture (click on book cover to read the entire article) describes the timeline of children’s author, Martin, and how she came to select Piggle-Wiggle as her new project. As a fan of Mrs. Piggle-Wiggle (How I wish she lived in my neighborhood. She’d be number one on my Contact list for sure), I am looking forward to more Piggle-Wiggle. [Just how do we reduce the amount of screen time our kids devour? Mrs. Piggle-Wiggle is sure to have the perfect cure. This entry was posted on September 8, 2016 at 5:37 pm and is filed under Adult Readers Advisory. You can follow any responses to this entry through the RSS 2.0 feed. You can leave a response, or trackback from your own site.